One of the most obvious strategies in NASCAR racing is to pass as many cars as you can by coming up on either the right or left side of the car in front (see Figure 1). But passing during a race isn’t like driving around a slow car on the highway. Even if the driver is trying to pass someone on the straight, wide part of the track, it may be difficult because that driver doesn’t want anyone to pass him. Figure 1: Even on a straightaway, passing another car can be difficult. And that driver will do anything he can to stay in front. Battling for position means the car that the driver is trying to pass is on the same lap as the driver. For example, a driver is battling for position with a car ahead of him when he’s in fourth place and that car is in third. If a driver is trying to pass a car that’s on the lead lap or on the same lap he is, it’s a good guess that the driver-to-be-passed isn’t going to let the oncoming car casually drive by. He’s going to try to block, meaning he will try to put his car exactly where he thinks another driver is going to try to pass him. That requires plenty of concentration and plenty of glances into the rear-view mirror, but when a driver knows how to throw a good block, even the best cars can’t get by him. When a driver is trying to pass another car, he must be patient and stay right on the bumper of the car in front. He must also pay attention, especially going through the turns, because that’s the perfect place to make a move. Passes frequently occur in the turns, where cars tend to become difficult to drive — and easy for other cars to pass — particularly if the car in front isn’t prepared for the race correctly. If a driver can’t zoom by and easily pass, he must wait for the driver ahead to make one mistake, even a small one, in order to get by. 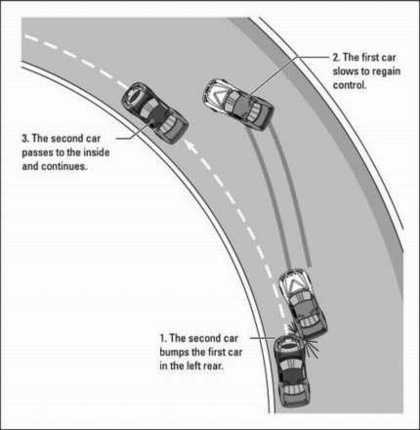 This scenario could happen when the driver of the car in front takes a turn too wide (see Figure 2) and slides up the track when coming out of a turn. 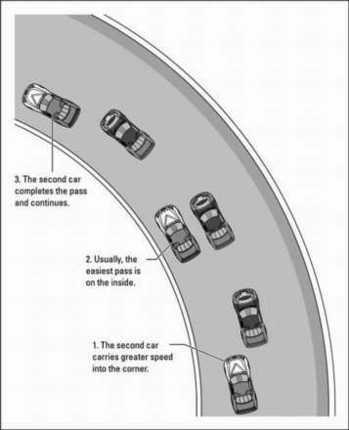 Figure 2: When the car ahead of you drifts up the racetrack going through a turn, it’s a perfect time to pass. Or, a chance to pass could happen when that driver takes his car into a turn too quickly and loses control for a split-second. That’s why drivers are more focused than usual when they go through the turns. They know they must capitalize on other drivers’ errors and be ready to make a pass when the other driver slips up. At short tracks, passing isn’t as much of an art as it is a technique. Cars at short tracks are going relatively slowly and there is plenty of downforce — which means the cars stick to the track — so drivers can be very aggressive without causing a big accident. 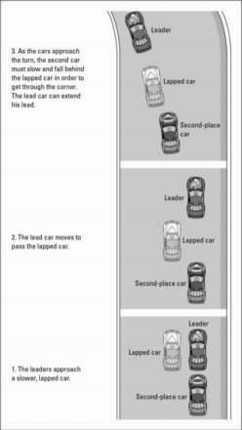 In order to pass a car in front, the driver doesn’t necessarily have to go below him or above him on the track. All he has to do is give the car a healthy tap — called a bump — on the rear bumper, as shown in Figure 3. Most of the time that will cause the car to float up the track and give the driver enough room to pass by. Figure 3: At short tracks, the technique is simple. If a driver doesn’t move out of the way, someone moves him. NASCAR frowns on this bump-and-pass technique, especially at bigger tracks where it would be a dangerous move. But at short tracks, it’s tolerated some of the time. For example, when the late Dale Earnhardt smacked into the back of Terry Labonte on the last lap of the night race at Bristol in 1999, he moved Labonte out of the way to win. The problem was, he also spun out Labonte and sent him into the wall. The driver in the lead wants to get as much space between him and the second-place car as possible. This becomes a problem — and a great, big pain in the neck — when that driver comes up on lapped traffic. Lapped traffic is made up of cars that aren’t on the lead lap, which often are considerably slower than the leaders. So when the leader is trucking around the speedway, the last thing he needs is a bunch of slower cars getting in his way. It’s sort of like driving in the fast lane on the highway and having to slow down when there’s a slow car ahead of you that just won’t switch lanes. Sure, you could pass on the right, but what if another slow car is in the right lane? You’re stuck behind those cars until one or both of them decides to move out of the way. Drivers have the same problem in racing. When the lead car gets caught behind lapped traffic, the driver in second — who has no one ahead of him to slow him down — has more time to catch up to the leader’s back bumper. 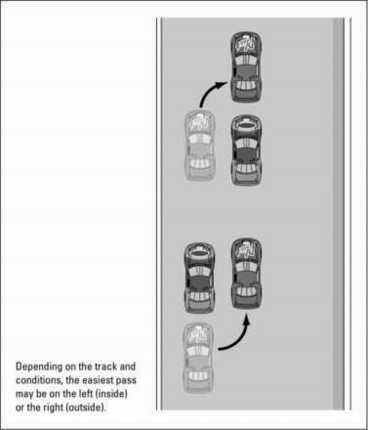 On the other hand, if the lead driver can pass the lapped car just before going into a turn, the second-place car gets stuck behind the lapped car (see Figure 4). Figure 4: When lapped traffic gets in the way of a second-place car, the leader has a chance to gain ground.